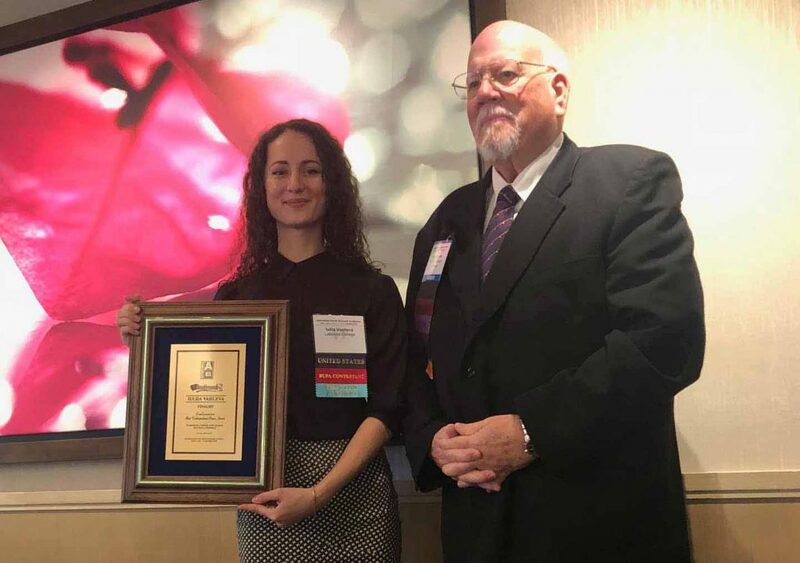 Iuliia Vasileva ’18 (economics and international affairs) took home the prestigious Best Undergraduate Paper Award at the fall International Atlantic Economic Conference in New York. Her paper, “The Effect of Inflation Targeting on Foreign Direct Investment (FDI) Flows to Developing Countries,” was chosen from among 100 original entries during a vigorous judging process along with three other papers presented at the International Atlantic Economic Conference before a panel of judges from around the world. At the conference, Vasileva’s paper was chosen as Best Undergraduate Paper. “I’m very honored to have been chosen as finalist in the Best Undergraduate Paper competition and to have won the award,” she said. “The competition allowed me to share my work and get invaluable feedback from academics from all over the world. During my past four years of undergraduate studies at Lafayette I have put every effort into maintaining the highest level of academic achievement. As winner of the competition, she received a $500 award, and her full paper will be published in Atlantic Economic Journal. Her paper shows that inflation targeting helps to increase foreign direct investment (FDI) flows into developing countries. Although the amount of FDI in developing countries has increased greatly over the past several years, not all of them have been successful at attracting it. Since inflation targeting creates stable macroeconomic environment in countries that implement it, this monetary policy can help developing countries to increase the amount of foreign investment they receive. The award for her work would not have been possible without professors at Lafayette “who are truly invested in their students,” Vasileva said. disciplines. The organization has held the undergraduate paper competition for the past 15 years.